We take such pride in our manual moss removal service that gently scrapes the moss off your roof tiles. This makes it the best possible roof cleaning method for the long-term preservation of your tiles. Here at surrey roof and gutter clean, we know how to not only clear out your gutters safely, but also prevent its future occurrence through the installation of mushroom caps and leaf guards. We use Mossgo because there just isn't anything else as effective, long-lasting and kind to your roof. You'll be astonished by the results. We are also the only Mossgo contractor in the area. 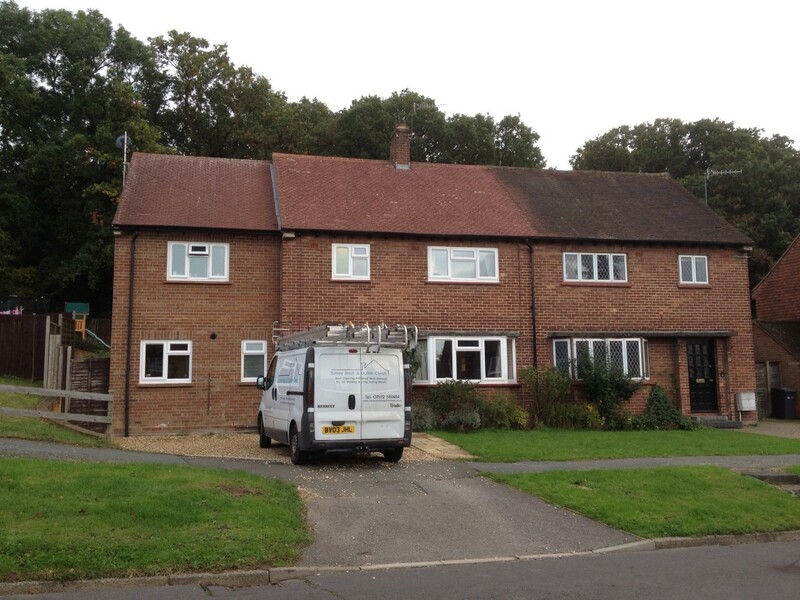 At Surrey Roof & Gutter Clean we specialise in professional roof and gutter cleaning services. Based in Guildford, and operating across Surrey and the surrounding areas, our reputation has been built on our fast and reliable services and exceptional cleaning results. Here at Surrey Roof & Gutter Clean we manually remove moss by hand (no jetwashing!) then apply biocide which will stop moss from returning. We’ve invested in some of the very latest and most sophisticated cleaning equipment, allowing us to offer great roof cleaning results for our clients without the need for aggressive treatments. Rejuvenating roofs and guttering systems and adding longevity to the life of roof tiles, our work comes with no complications and always great results. With up to £1 million public liability insurance cover, our skilled and highly-trained team are equipped to carry out all work to the highest of standards. If dirty, moss or algae-covered roofs are distracting from your property’s appearance and moss dropping to the ground is becoming a nuisance here at Surrey Roof and Gutter Clean we have a number of treatments to uncover the beautiful coloured roof hiding beneath the years of grime. 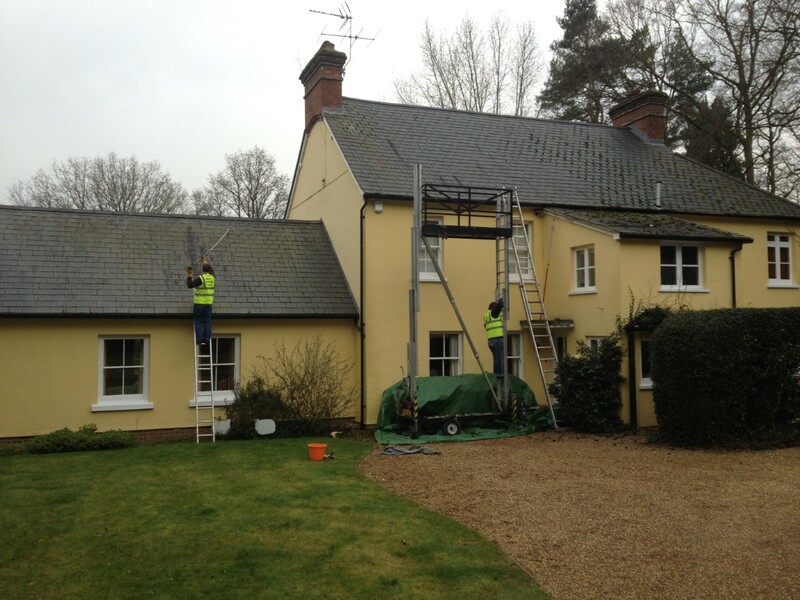 To avoid marking and damaging your tiles with any abrasive pressure washing, we undertake manual moss removal, and our fast acting biocide agent is 100% effective, removing lichen, moss or algae and returning the colour to your dull, dark or stained roof tiles. Gutters are easily blocked with soil, silt, leaves and other natural debris, and if left untreated can cause serious damage to your property. Here at Surrey Roof and Gutter Clean our team are on hand to safely clear out your gutters and install systems to help prevent blockages from occurring in the future. We also undertake professional cleaning services for driveways and patios, transforming tired-looking wood and removing algae growth. Our methods are proven to be longer lasting and less abrasive than traditional jetwashing. Our team are on hand to offer advice on any cleaning project. Contact us today for further information about our roof and gutter cleaning service.